Just in case you didn’t know, Nutella is life. It really is an ambrosial ingredient that makes any type of dish that much more incredible. So if you are a Nutella connoisseur like me, mark your calendars because the Nutella Truck tour is underway. The tour kicked off in Burlington, ON on June 16 and will be making its way to Vancouver, Edmonton, Toronto, and Québec City from June until September. They have already started their road trip across the country and they’re adding a little joy to all of the people they meet on their way. They are serving up delicious Belgian waffles and tasty fruit cups with Nutella. Check out the dates to catch the truck and bring your family for mouth-tantalizing food, fun games and a chance to win prizes! There is always a jar of Nutella in our home and our favorite ways to use it is for breakfast, brunch and brinner. Yep, that pretty much covers it. In celebration of the epic truck road trip, Canadian celebrity-chef Stefano Faita has teamed up with Nutella to create six mouth-watering new breakfast recipes that show how a little twist can take your mornings to a whole new level! The recipe above is a unique take on latkes with carrot, apple and Nutella. I can only imagine the creaminess, delicious taste and texture. Plus, you cannot go wrong with the added protein and subtle acidity from the added cottage cheese. This would be ‘morning made’ status in my books. Chef Stefano has created these recipes with family in mind. They’re exciting, fun and best of all– tasty! I know my kids aren’t usually excited for breakfast but, if there is Nutella in it, it ALWAYS results in a clean plate. You can see all of Chef Stefano’s recipes here but, be warned. You will most likely make them all! Is your mouth watering yet? I’d apologize but, I can’t help that Nutella induces that reaction. Plus, now you are armed with some new and taste bud tantalizing recipes from Chef Stefano. 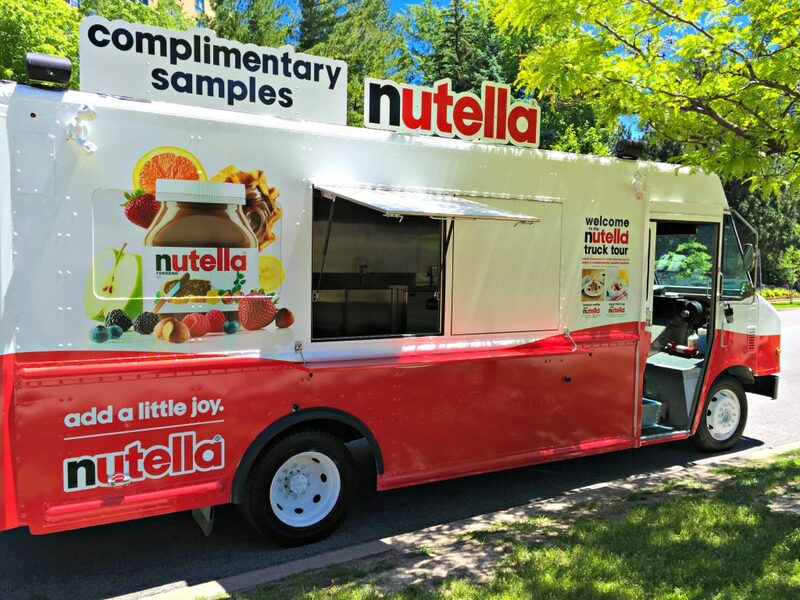 Hopefully you can make it out and catch the Nutella Truck when it comes to your city! I know I will be trying to convince Hubby to make a trip up to Toronto for CNE, just so I can catch the truck. Cross your fingers for me, folks! 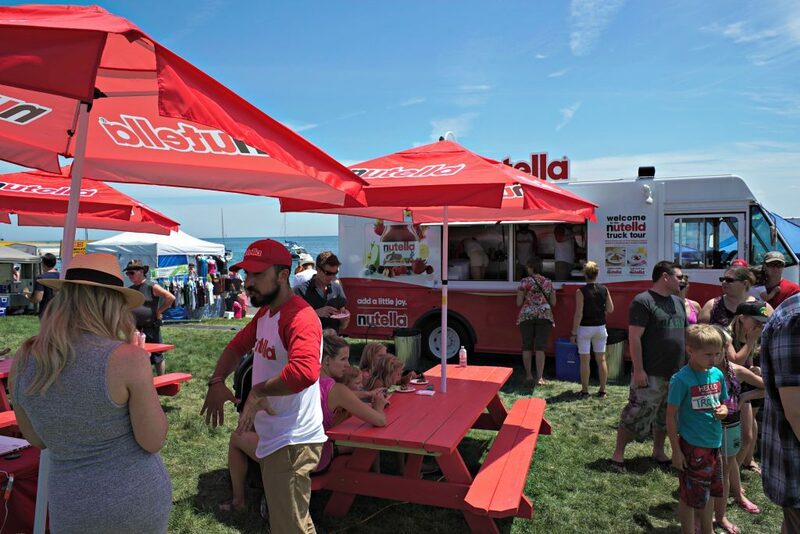 Make sure you stop by one of the festivals for some fun and a complimentary Belgian waffle with Nutella or fresh fruit cup topped with Nutella. You’ll even have the chance to play Nutella Plinko for a chance to win wicked prizes. Plus, bring your selfie stick or get a photo taken with a larger-than-life personalized jar of Nutella. This is what Nutella dreams are made of, people! For more deets about Chef Faita’s new Nutella recipes and to find more recipe inspiration, visit nutella.ca. Nutella lovers unite and stay up-to-date on how to #AddALittleJoy with Nutella by following Nutella Canada on Facebook and YouTube and Nutella Global on Twitter. Do you need a little joy in your life? So good! 🙂 My kids love it! I just went to the supermarket at got my daughter a little snack pack of Nutella with sticks. She loves eating them and Nutella taste good. Oh they are THE best! We love Nutella in our house! I would love a Nutella truck tour in my city! Yum! It is delish, that is for sure! I hope I can catch it too! That sounds really fun to visit the Nutella truck. Would love to make it to one of them. Nutella truck tour would be an amazing thing if it would come to the U.S. for sure. My son love every thing with Nutella on it and I have been saying we need to go to Canada. We are not far from the border.. Thanks for sharing this awesome tour. You should come on over for CNE! My niece likes Nutella. I am curious and would like to try it myself. I would love to catch the truck on its your. Nutella is out favorite and I do not feel bad feeding it to the kids. LOL… I would stalk it too! I love Nutella! I need to try it on more things. I should pick some up the next time I go shopping. I love that they have a truck tour! Yes! I have a post coming up that will help you with that. Stay tuned! That would be so fun to visit. I wish they were having a tour near us. Would love to go. Nutella is one of the best things in life. Seriously, I love it so much! Nutella is so good. I actually had to stop buying it because it would be all I would want for breakfsst like everyday. Haha, it is always in our house. I have to restrain myself…if I can! Love this! You can put Nutella on anything and it would be so delicious!!! My kids are a b iggest fun of Nutella, though I find it a little expensive to buy I try to get a jar for them every now and then. I hope that truck tour will reach our place. I have not met a kid who does not love Nutella! We always have it in our pantry. It is great for a snack or light breakfast. A jar can go a long way! oh my word, two of my favorite things all in one – food trucks and nutella! i have a recipe at my blog featuring nutella and it is by far my favorite dessert all time ever! My gosh, me too. Nutella is one of my fave things ever! How cool is this. I wish we had nutella truck near in my place. Awww, you can always pick some up. That helps me! Oh my gosh! I wish that this was going to be near us! The apple and carrot latkes sound absolutely to die for! Everything with Nutella is great! Hehe, I do not blame her! Thank you for the heads up about the Nutella truck. I had no idea. It now it goes on my list to see at the PNE. We miss out on everything,nothing ever comes across to Newfoundland.